ShakyPlanet is proud to announce the newest Solar Series eCollectible – Neptune! 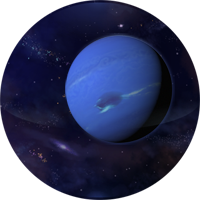 Named for the Roman God of the sea, Neptune is the eighth and farthest planet from the Sun in our Solar System. It is the fourth-largest planet by diameter and the third-largest by mass. Nasa’s Voyager 2 probe took some photos as it swung past Neptune and caught some faint rings around the ice giant. Get free eCollectibles® on the free ShakyPlanet® for iPhone! Visit the ShakyPlanet Facebook Fan Page and become a fan and keep up to date on all the latest eCollectible virtual goods. Copyright © 2010 Little Ricky Software, LLC. All rights reserved.